The launch of the iPhone 8 is still some way off but -- as with just about every smartphone of note (we're looking at you, OnePlus 5) -- lots of details have slipped out ahead of any official announcement. The latest leak "confirms" what we've long expected: that there's a quite significant redesign coming up. 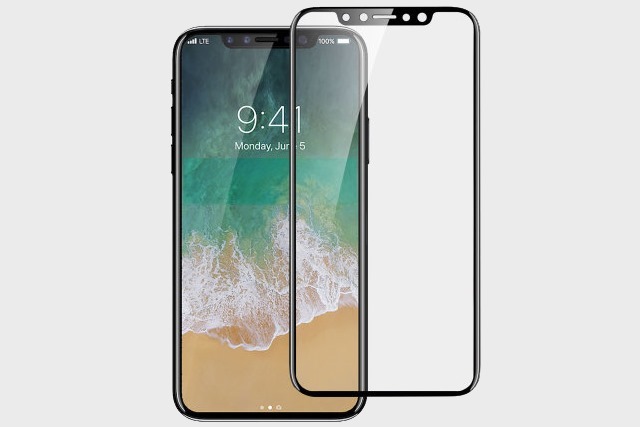 We have already heard rumors that the iPhone will be near-bezel-less, and we've seen supposed production-line images that show off the front and rear panels. The front panel images showed a weird cut-out at the top of the phone and a new listing on accessory website MobileFun for an "Olixar iPhone 8 Full Cover Tempered Glass Screen Protector" appears to back this up. Something that has thus far prevented phones from having as small a bezel as many would like is the fact that a camera and speaker tend to be mounted above the screen. This is not -- we can now be fairly sure -- the case with the 5.7-inch iPhone 8: the top of the screen appears to feature a cut-out to house these components. Eating into what would normally be the notification area, the cut-out appears in a listing posted on MobileFun. The page for the Olixar iPhone 8 Full Cover Tempered Glass Screen Protector - Black ("black" implying other colors will also be available) shows both an iPhone 8, and the screen protector; both feature the same cut-out design. It has been suggested that the missing notification area could be replaced with a MacBook Pro-style touch bar feature at the bottom of the screen called the Function Area. Of course, all leaks should be treated with a degree of scepticism, but MobileFun has a decent track record of providing information about upcoming handsets months before they are announced.